I have a very interesting, unique personality. Sometimes, I’m in a great mood and nice to everyone around me. I can light up the world with my smile, and I really am a nice girl. Sometimes, I’m down right sardonic. The point here is that sometimes I’m a little sweet and sometimes I’m a little sour. It makes sense that one of my favorite dishes before “the change” was sweet and sour shrimp. There’s this great Chinese food restaurant on Santa Monica Blvd called Jin Jiang. It looks like something straight out of Temple of Doom. At least I think it was Temple of Doom that started out in some 80′s-tastic chinese night club. Am I right here? Oh yea, so this is a food blog. Point is, sweet and sour sauce is easily made vegan. However, you need to decide what to pour it over. I’ve been meaning to try it with vegetables, but I really love it over tofu. I’ve been eating a bit of tofu lately (and balancing it out by using rice-milk instead of soy). This dish is best served over steamed rice with a side of lightly steamed vegetables. I like to go with snap peas, mushrooms, and broccoli, but really you should do what you feel. In a small saucepan, bring vinegar, ketchup, agave, and soy sauce to a boil. While the sweet and sour is thickening, rinse and pat dry about half a package of tofu. Cut it into some artful pieces. I’ve seen triangles, but I usually go for the more classic cube. You could use star-shaped cookie cutters if you need to get magical. Coat a pan with nonstick spray and dredge the tofu through the cornstarch. Cook over medium heat until golden brown, flip and repeat. 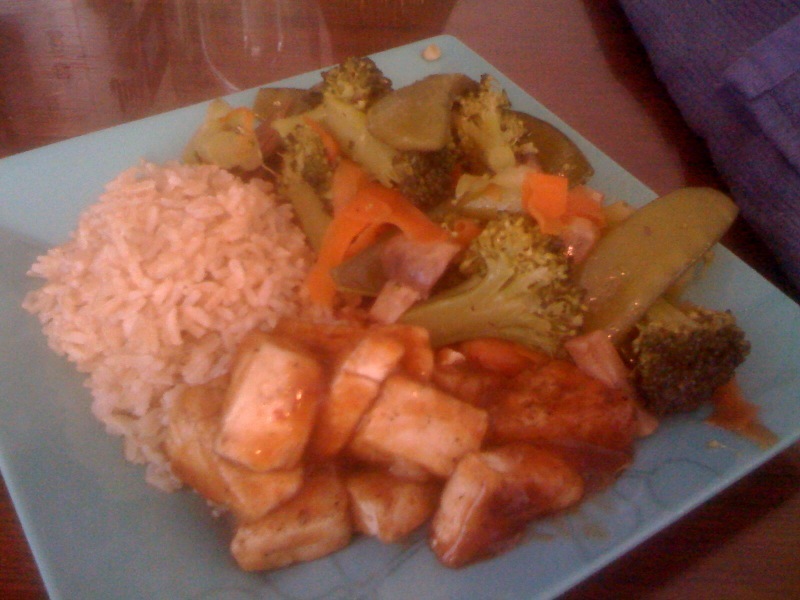 Serve by plating your tofu and drizzling the sweet and sour over it. This past weekend, I made a spinach and basil pasta salad for a veggie hikers potluck. It was a pretty good pasta salad, although nowhere near as delicious as some of the other food that people brought. It left me with a good deal of leftover basil. One day I’m going to get myself a window box and plant some herbs in it, so that I can avoid the mess of having to buy such a huge package of basil. I’ve literally used basil every day this week: pesto pasta salad on Sunday, pesto sauce on my pizza on Monday, basil on top of my stir fry on Tuesday, and today I used it in my tofu scramble. Catherine de Medici is credited with introducing the term “florentine” into french cooking. In 1550, she declared that anything with spinach would be refered to as florentine. Unfortunately, it has come to traditionally refer to a dish with spinach AND a creamy sauce. 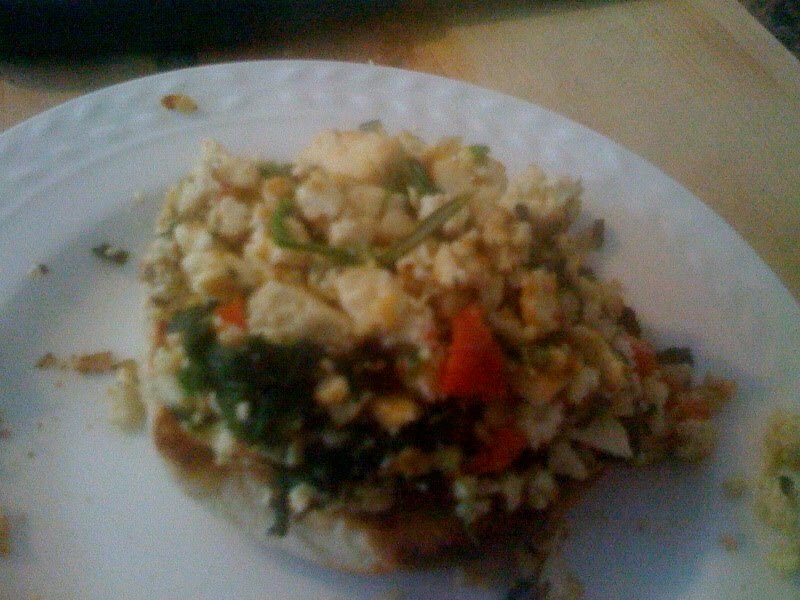 My tofu scramble has no such creamy sauce, but I’m going to stick with Catherine on this one and call it Tofu Florentine. The important thing is that it is absolutely delicious. I’ve tried making tofu scramble before and was not 100% impressed with the flavor profile that I put together. This scramble, however, is exactly what one would expect. It’s made light by the spinach and grape tomatoes, but is still delicious and filling. I served it on top of an english muffin, and it is probably the best breakfast I’ve had so far this week. In a nonstick pan, combine frozen spinach and 2 tablespoons of water, stirring frequently. While the spinach is defrosting, mince the garlic and cut the tomatoes into quarters. Roll up the basil leaves and slice lengthwise to create slivers. Remove the spinach from the pan when it is fully defrosted and warm. Spray the pan with non-stick spray and add the garlic. Cook over medium-high heat until the garlic is browned. While the garlic is cooking, crumble the tofu into a bowl with your hands and mix with the nutritional yeast and a pinch of yellow curry powder. Add salt and pepper to your liking. You may wait until the end to add the salt and pepper, especially if this is your first time with the dish. It allows you to adjust the flavors to your liking. When the garlic is brown, add the tomatoes, spinach, and tofu. Reduce heat and cook over medium until the texture resembles, well, scrambled eggs. Add the basil and give it a final stir before serving over toast or alongside hashbrowns. This post goes out to Carolyn, Carolyn Dempsey, who has been holding very successful taco nights in her Brooklyn apartment. She was telling me how much fun it was, and I got pretty jealous. However, I decided to use my jealousy as a motivator (which I read about doing in a Cosmo article) and make my own tacos. Beans were obviously an option, but I feel like that one has been played out. I’ve had tofu burritos before and always thought that they were delicous, so I decided to give tofu tacos a spin. A note on tortillas: This is a situation where you need to check your labeling. The tortillas that I buy from Trader Joes have 2 ingredients corn flour, water, and lime. These are good tortillas. Some tortillas are made with lard. Lard comes from baby animals. Eating baby animals = not vegan. Also, who really wants to be eating lard anyway? Which brings me to my semi-sequitor of the day. Did you know that Guiness beer is not vegan? It’s finished with something called isinglass, which is a nice way of saying that they add fish scales to the beer during post-processing as a clarifying agent. I’ve had a lot of fun over the past couple of days pointing this out to people and watching them make faces. Now, I’m not usually one of “those” vegans who tells you about how bad your food is, but this one really grossed me out. Also, I love random trivia and anything involving beer clarification gets filed under random trivia. your choice of shredded lettuce, tomatoes, salsa, or vegan sour cream. Rinse and pat dry your tofu and cut into 1/4″ cubes. Place these in a Tupperware container and add about 1.5 tablespoons of corn starch. Put the lid on the Tupperware and shake to coat. In a separate bowl, mix chili powder, garlic powder, cumin, salt, and pepper. Whisk to combine the spices and add to your tofu. Close again and shake to coat. Spray a pan with non-stick cooking spray and bring it to medium-high heat. Add the tofu and water and cook for about 5 minutes, or until it’s firm. Serve in a taco shell or two with cheddar daiya and your choice of accouterments. Who didn’t love the comic strip and television cartoon about that fat orange cat who seemingly lived for the sole purpose of shipping dogs off to Abu-Dabi? More importantly, who doesn’t love a good lasagna? 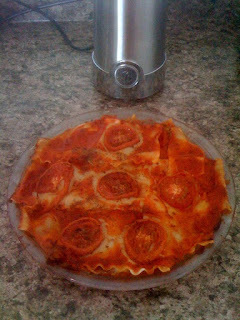 I used to take great pride in finding the perfect ratio of mozzarella to ricotta to tomato sauce to pasta. Then, I realized that putting 4 tablespoons of spinach into a 12-serving tray did not a healthy dinner make. Lasagna is comfort food, and with my discovery of vegan ricotta cheese, seemed like a good idea to me. This recipe has two components, first is a tofu-ricotta made with a food processor. This ricotta would be suitable for a baked ziti, or even on top of a vegan pizza with lots of garlic. I looked at a few recipes online, but they all seemed to use A LOT of olive oil, which kind of defeats the purpose of using tofu as a low-fat alternative to the ricotta. So, I reduced the olive oil and then when I was having trouble getting the mixture to blend, added a few tablespoons of unsweetened soy milk. Your goal is to get something with a thick but spreadable consistency. The addition of spinach and mushrooms not only packs in extra servings of vegetables, but the mushrooms give the whole dish a meaty texture. 6. repeat a layer of pasta, ricotta, mushrooms, and sauce. Your final layer will just be 3 noodles and then half a cup of tomato sauce. The verdict: I was not impressed with my tofu ricotta when it was raw. Even with the garlic and nutritional yeast, it tasted a little bland, but that is a natural trade-off when you reduce the oil in a recipe. However, once everything was cooked together with the mushrooms and spinach, it tasted exactly like the real thing. Real ricotta looses some of its flavor when you put it in a dish, but the secret must be that tofu ricotta actually gets better.